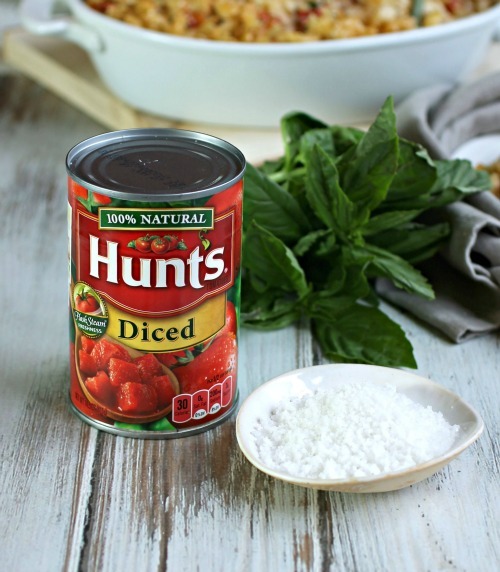 Thank you to Hunt's tomatoes for sponsoring this recipe. So, the weekly gatherings of football fans and/or fans of the food at gatherings (that would be me) is over now that whichever team you were rooting for either won or lost the Superbowl. And, no, I have no opinion on this because I was watching the Puppy Bowl in the other room. But, seriously, the gatherings have certainly not ended because it's award show season. So much more fun to watch with a group. But this means we're back to the question of what to serve at viewing parties. Since it's also currently 2 degrees outside (yes, 2!) I can only think of hot, comforting foods with hot bubbling cheese. 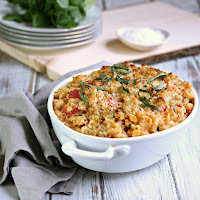 The classic mac and cheese is great gathering food but I decided to give it a twist. 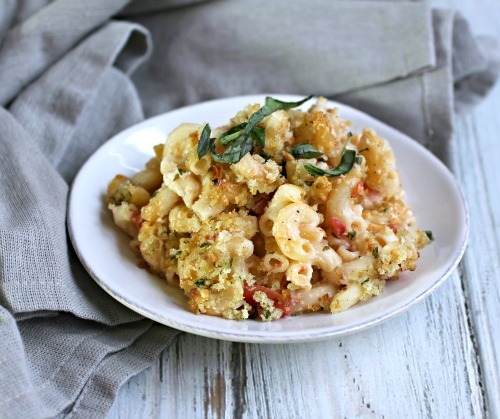 Instead of serving a tomato, basil and mozzarella (caprese) salad on the side, why not just incorporate those ingredients into the mac? Just like the classic salad, I went with beautiful fresh mozzarella for this dish and wonderful fragrant basil. The fresh tomatoes...are best in summer (i.e. NOT 2 degrees outside) so my favorite can of diced Hunt's tomatoes did the trick. They can them right after picking and peel them using steam instead of chemicals. 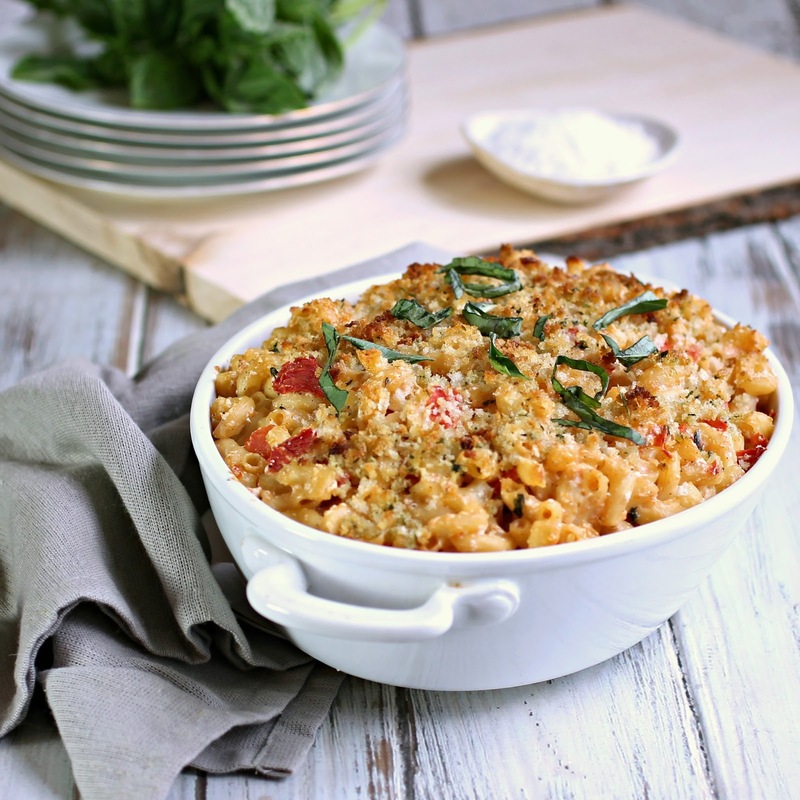 * So this version of mac is layered in flavor and great for a crowd. Enjoy! Cook the macaroni in a large pot of boiling salted water, according to package directions. While the pasta is cooking, melt the butter in a large skillet and whisk in the flour until you have a smooth paste. Slowly whisk in the milk and continue stirring, on medium heat, until the sauce begins to thicken. Stir in the mozzarella cheese, diced tomatoes, fresh basil and Parmesan. Season with salt and pepper. Drain the cooked pasta and add to the sauce. Transfer to a baking dish (or keep in the skillet if oven proof). In a small bowl, combine the breadcrumbs and olive oil and sprinkle over the pasta. Bake in the oven for approximately 20 minutes or until the top is a light golden brown. This recipe was sponsored by Hunt's tomatoes. Thank you for supporting the products I love and use in my kitchen. 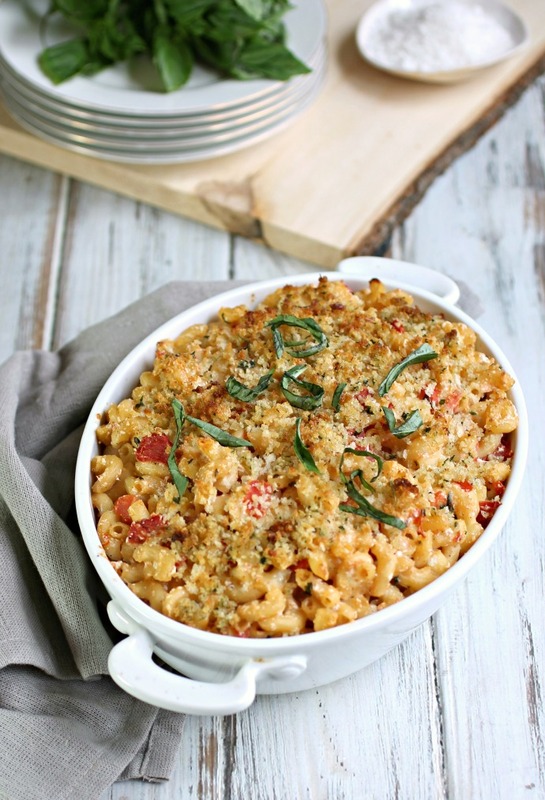 Yummmm....your Caprese Macaroni & Cheese looks so tasty!